Descending from the higher mountain elevations of Colorado, I drove through the more arid desert climate of New Mexico on a search to find the Earthship Headquarters located north of Taos, New Mexico. The Earthship Visitor’s Center is located 7 miles north of Taos on Highway 64. The Earthship type of housing, imagined into actuality by architect Michael Reynolds, uses recyclable, easily available materials to create a type of housing that can potentially sustain a household living off the grid. A passive solar type of building, the Earthship collects its own water, has its own water treatment system, can grow its own vegetables and generate its own electricity from solar photovoltaic (PV) panels and wind turbines. Curious about seeing a true Earthship (I’ve worked on modified earthship – type houses) I wanted to see and experience this seemingly ideal type of housing in its official headquarters. As one nears Taos from the north, soon large mounds dirt can be seen rising in the distance. These mounds are the bermed northern side of the Earthship, while the large, rectangular windows that comprise the front of the house, face the south. The Earthship, is referred to as a type of “Biotecture”, is a “radically sustainable” type of building. A versatile building, their organization is expanding upon the range of Earthships beyond New Mexico, creating these types of buildings around the world, in diverse climates that include Haiti, Australia, Africa and South America. While the Earthship building process is dynamic as any building process is sure to be, it is interesting to see how building techniques and inclusions have changed over the years. After arriving at the Earthship headquarters and tour site, a wall of slanted south facing glass on a green colored Earthship welcomed me. 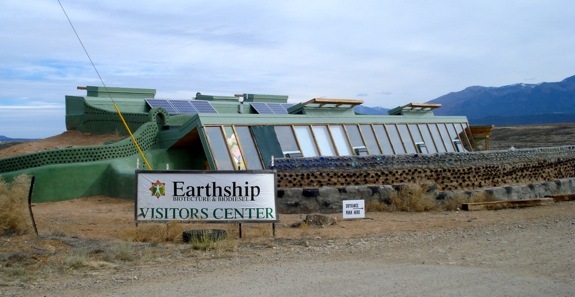 I visited the Earthship Visitor’s Center in the middle of March 2011. The outside mid morning springtime air was around 55 degrees Fahrenheit. When I entered the Earthship, I was greeted by temperature of 77 degrees, along with a wave of humidity from the lush, moist environment created from the moisture associated with the plants, enclosed in two different greenhouses. 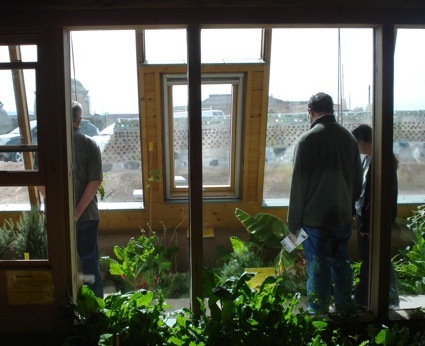 The idea behind the Earthship is that it is a holistic, sustainable living system. Recycled materials are used throughout the building process of an Earthship. 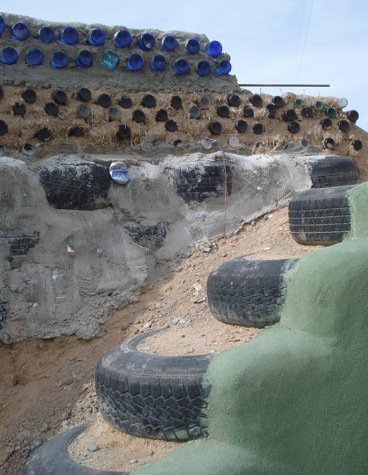 Retaining walls are built with recycled bottles and tires. Perhaps influenced by the adobe (earthen mud) building heritage of New Mexico, dirt is rammed into recycled automobile tires to create the outer, load bearing walls of the structure. In order to support the weight of the building, hundred of pounds of dirt are pounded into the tire to create something similar to a large circular brick. These tires are filled and stacked on the previous layer to create the outer wall. The non-load bearing walls utilize other types of recycled materials such as aluminum cans or glass bottles, the extra space surrounding them is filled with adobe or cement. The use of these recycled materials creates space, that would have otherwise been filled with an excess of building material, while the filler material increases the thermal mass of the building, extending the ability of the building to store and release the heat energy of the sun. 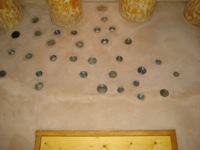 Recycled glass bottles are used both as decoration and/or to let in light. Glass bottles decorated the space above the bathroom door. The inner non-bearing walls of an Earthship are often thick, created with recycled aluminum bottles that get covered with a mud mixture of adobe. Earthships are usually built on an east – west axis that often results in a rectangular shape, with the long south-facing side of the house situated to face the sun as its travels through the sky. 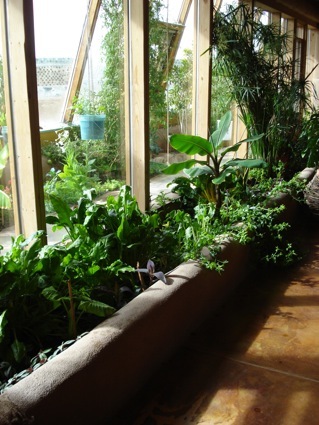 Earthships are situated in this manner to be ideally situated to collect the heat energy of the sun during the day and release the heat throughout the cooler evening and night. Because the outer walls of the house are made from recycled tires filled with rammed earth, there is a lot of thermal mass in the building that helps to keep the temperature of the house relatively stable. 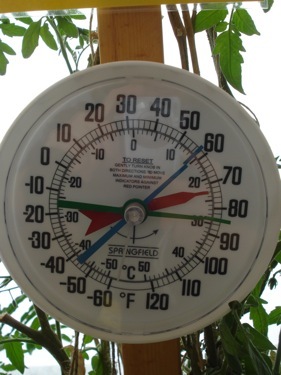 In the previous night, the actual temperature sank to 28 degrees Fahrenheit, just below the freezing point, and rose to 58 degrees the following day, yet the inside temperature of the Earthship house ranged from 59 to 84 degrees. I visited in the springtime near the spring equinox, so the spring sunlight still reached into the house. Yet in the summertime, the sunlight (and heat generation) does not reach past the extent of the greenhouse. Earthships have changed to incorporate two walls of glass; the inner vertical one and a slanted outer windows. Note that most of the Earthships have slanted glass that face the outer elements. They have recently started creating Earthships with two layer of glass: one layer of slanted glass that protects the dwelling from the outside, and another vertical wall of glass inside the house. A friendly greeter informed me that the vertical inner glass was a new addition that was added about two years ago. I think that this makes good sense, to separate the living space from the greenhouse space, however, there was little difference in how the inner and outer greenhouse felt in regard to the high levels of humidity (since both had planters). Originally, there wasn’t a separating inner glass wall that separated the living spaces. While there wasn’t any sort of explanation, I suspect that the change occurred because the high levels of humidity in the main living area may have caused moisture and condensation issues. I ran into the person that does the Belagio hotels atrium. He gave me this site last year sometime. Coinsidence I don’t think so!